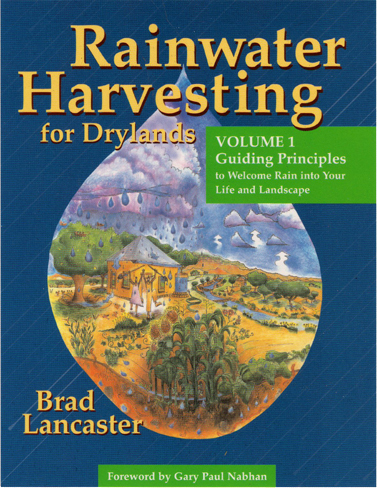 It seems to be common sense to me, in this land we call the desert, to capture and store as much rainwater as possible. Yet it is apparent that most home sites have been designed to do the exact opposite. I get very annoyed every time it rains. I cannot help to notice all that fresh clean rainwater flowing out of people's gardens into the street. From there becoming polluted with the oil and chemicals from all the roads on its way to the sewers. From this point, as taxpayers, we pay for this free resource to be cleaned and pumped back to our taps in the house. So, I hope it is now more clear to you that harvesting rainwater on your home site is not only economical, but ecological as well. On this page you will find several resources for containing your own rainwater in simple and economical ways. This publication is a free download, supplied by the city of Tucson, and is a 41 page water harvesting manual. For your supply of used drums, for rain water storage, visit this local supplier who has non-polluted products for sale. I am being asked more and more to speak to the board and its members of home owners regarding the ways in which watering of the landscape can be decreased. The numerous resources on this page will be a guide for you to follow. However, if you wish to use my expert knowledge for your specific circumstances, I can be available by appointment. NOW YOU ARE READY FOR RAIN !! !